Are you passionate about putting an end to Alzheimer’s disease? Do you want to get more involved in our community by volunteering with the the Alzheimer’s Association and the Walk to End Alzheimer’s? Then we need you! In order to grow, we must continue to enlist and empower more volunteers to help us extend our reach. The Alzheimer's Association Walk to End Alzheimer's(r) is the world's largest event to raise awareness and funds for Alzheimer's care, support and research. Held locally in the fall, committee members serve on specific subcommittees to help recruit and train walk teams as well as plan all aspects of the event including coordinating logistics, securing sponsorships, develop marketing, outreach and advocacy efforts. The time commitment is 5 hours/month. 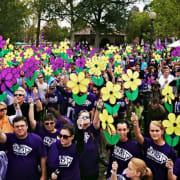 The Mobile Bay Walk to End Alzheimer's is September 8, at 2pm at Bienville Square in Mobile, AL, and we are looking for volunteers from Mobile and Baldwin Counties!